Something a little different today. 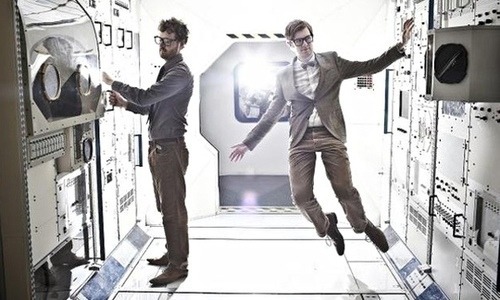 A song from a pair of nerdy looking Brits, ironically call ‘Public Service Broadcasting’, that make electronic music edging it’s way into art-pop. They have just released their second album and it’s an intergalactic masterpiece. The album, ‘The Race For Space’, is a concept at it’s core. Samples of actual archival samples from Apollo missions of the 60′s, the centre of the Russian and American race for space supremacy, fill the gaps and add to the build-up and tension of an album that feels fresh and innovative despite it’s commonplace appearance. Go! is one of the highlights from the album. A pulsing, energetic space ride to the moon, with Apollo 11 samples adding to the anticipatory theme. It explodes with a crescendo of guitar, keys and samples to complete the illusion ending almost prematurely. Even if electronic music is not your bag, check out this expertly crafted band. Worth the effort and they’re not at SXSW for nothing!